Oxley-Gidding was the first choice of wealthy clients around the world, due to the fine craftsmanship and sparkle of their top quality crystal. 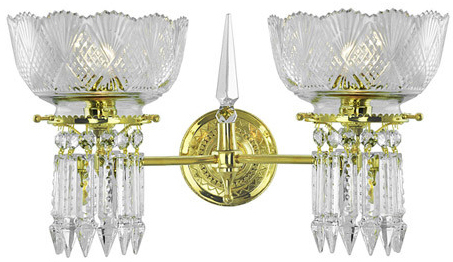 This crystal wall sconce matches our beautiful Oxley-Giddings chandeliers. Bring your lighting down to eye level in hallways, next to the fireplace, or over the buffet with this gorgeous addition. We recommend the use of sconces in pairs. Backplate: 4 ⅜" in diameter. Wattage: Wired to UL standards, with two sockets capable of up to 100 watts incandescent each. Total yield of up to 200 watts incandescent. Glass shades are sold separately for maximum customization. We picture our precision hand cut glass shade. Hand cut and etched shades give the proper ambiance for these top quality sconces. Our handcrafted crown-top shade is another suggestion. Our Oxley Giddings chandeliers are recast in two sizes, Victorian crystal 6 light and a lovely Victorian crystal two tier 10 light. 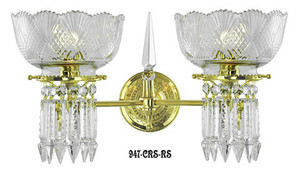 We also have two more choices of matching crystal wall sconces: crystal prism wall single sconce and our deluxe crystal prism double sconce.